When the Web was young, experts generally advised that browser cookies were harmless. That was before detailed user tracking across multiple sites and aggressive advertising targeting. You may appreciate the cookie that logs you into Amazon.com automatically, but you might be less eager to share your browsing habits with companies building detailed user profiles. Cookie Stumbler Standard (Mac App Store link for Cookie Stumbler Basic) finds browser cookies, including advertising and tracking ones, and gives you the option to delete them all, or inspect and banish them individually. Like antivirus software, Cookie Stumbler combines an application with a subscription to regularly updated definition files. These definitions identify known advertising and tracking cookies, and delete them, based on your preferences. Cookie Stumbler currently supports ten browsers, including Safari, Mozilla Firefox, Google Chrome, iCab, and OmniWeb. It also scans Flash cookies set by Adobe Flash Player; flash cookies are not removed by a browser cleaning, even if Flash was invoked by a website. The first time you run Cookie Stumbler, it scans your Mac for browsers and their associated cookie databases, reporting back all of the cookies it finds and suggesting which ones are undesirable. You can follow its recommendations, and scroll through the complete list to inspect all cookies found on your Mac. 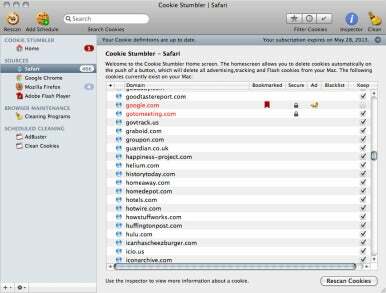 Cookie Stumbler notes each cookie-setting domain’s status; bookmarked, secure, advertising-related. blacklist, or keeplist. The blacklist and keeplist settings are suggested by Cookie Stumbler when it scans. You can override each one manually, if you wish, or double-click a domain to see what Cookie Stumbler’s site advisor feature has to say about it. An inspector gives you even more information about the domain’s cookies. If you’re way into cookies, the inspector is quite useful, giving you a window into exactly what each cookie is doing. Since new cookies are generated almost every time you browse the Web, the best way to clean your system is to schedule Cookie Stumbler scans at regular intervals. You can choose cleaning actions based on cookie types, and set them to run daily, weekly, monthly, or at other regular intervals. The value of this “set it and forget it” approach to cookie cleaning becomes clear as the number of cookies mounts. Cookie Stumbler is for people who are both concerned about their privacy online, and interested in understanding the sources of the many threats.